Decorative Life: 4-11 days, cultivars vary. With ‘Stargazer’, any flower less than 2.8 inches (7.0 cm) long at the time of harvest is much more prone to aborting. Store at 36-38 F (less than 3 days), 34-36 F (more than three days). Lower temperatures can cause chill related damage under some circumstances. With ‘Stargazer’, treating with MCP prior to storage can greatly reduce cold storage-induced bud drop. Oriental hybrids are the results of crosses using L. auratum, L. speciosum, and L. rubellum. Well-known Oriental lily cultivars include ‘Star Gazer’ (rose), ‘Casa Blanca’ (white), ‘Journey’s End’ (pink), ‘Mona Lisa’ (pink). Latin form of the Greek leiron (used by Theophrastus for the Madonna lily). Crosses between Easter Lily (Lilium longiflorum) and Asiatic or Oriental hybrids have produced the “LA” and “LO” hybrids, which often have little or no fragrance and improved leaf characteristics. 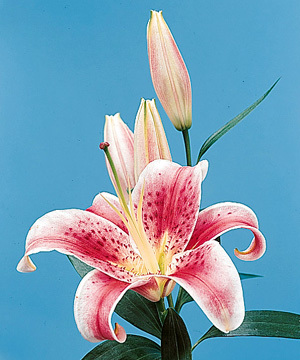 In Ancient Greece, the lily was the flower of Hera, goddess of the moon, earth, air, woman’s life, marriage and childbirth. In ancient Rome, it was the symbol of Juno, the goddess of light, sky, marriage and motherhood. Pollen sheds easily and stains whatever it touches. Removal of the stamens from the flower prevents this, but shortens vase life. With over 3000 species, the lily family includes many medicinal and food species in addition to ornamental species. The American Academy of Allergy, Asthma and Immunology lists this species as an allergy-safe pollen producing plant. With more than 100 species, the Lily genus has been in cultivation for centuries, and has acquired many religious and mystical associations. Known as the flower of the Virgin Mary, the Lily has long been thought to represent purity and innocence. For maximum flower coloration and leaf quality, Han (2001) reported that Orientals should be harvested and then placed in a flower food solution and sprayed with a commercial mixture of benzyl adenine and gibberellin 4+7 according to label directions.